President Trump vowed to go back to work the day after Christmas — and fulfilled that promise Tuesday by working on his backswing. The President sent out Christmas wishes a day earlier, implying that the remainder of his holiday vacation in Florida would be of the working variety. “I hope everyone is having a great Christmas, then tomorrow it’s back to work in order to Make America Great Again,” Trump tweeted. The President’s motorcade left his Mar-a-Lago resort just before 9 a.m. en route to the nearby Trump International Golf Club. He was hitting the links with Sen. David Perdue of Georgia, Bryson DeChambau, a PGA tour player and former PGA player Dana Quigley, according to officials. The time at the club on Tuesday marks Trump’s 85th visit to one of his golf properties as President, according to a tally kept by NBC News. 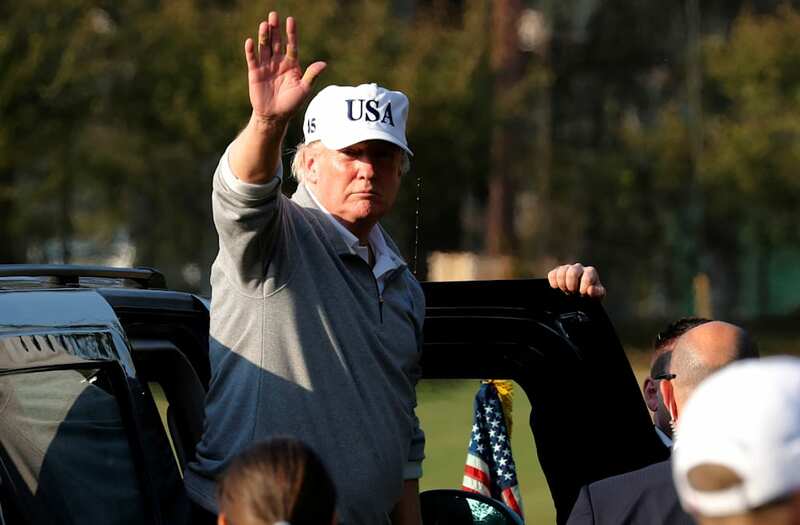 Despite his resolute statement about getting back to work — and his prolific complaints about former President Barack Obama’s love of hitting the links — Trump is on track to spend as much as triple the time Obama did on the golf course in his first year in office. He will also have played more than former President George W. Bush did during his eight years in office, according to CNN. During his 2016 campaign, Trump promised he would largely give up the game if he were elected president. “I’m going to be working for you. I’m not going to have time to go play golf. Believe me,” Trump said during a 2016 rally. He also promised he would not take vacations because there would be too much work to do. During Obama’s presidency, Trump routinely complained and made fun of his predecessor whenever he swung a club while on vacation. The President teed off his Christmas holiday trip to Palm Beach with a round of golf with host of PGA pros on Saturday. Trump has been celebrating his lone major legislative win after the Republican-led Congress passed a sweeping overhaul last week. He reportedly told friends at Mar-a-Lago “you all just got a lot richer,” according to reports.